As an admitted coffee-geek, I look forward to my morning cup of coffee the same way most people look forward to a rare steak, or perhaps big slice of chocolate cake. Sure, sometimes I get funny looks from my friends and family when I break out a scale to weigh my coffee beans (to the tenth of a gram) before I grind them by hand, but, hey, we all have our quirks…right? While you might not be quite as obsessed, who doesn’t love relaxing in a cozy café while enjoying a delicious beverage and doing some top-notch people watching? While in Boston, you’re definitely in luck! Boston’s Back Bay has several great, independent cafés just a short walk from our the Lenox doors. 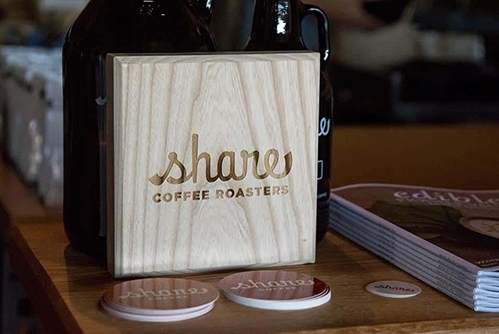 I would be remiss if I didn’t first mention our amazing coffee partner, and my personal favorite Massachusetts coffee roaster, Share Coffee, from Hadley, MA. Located a couple hours west of Boston in the Pioneer Valley, they produce some incredible coffee that we grind fresh for each batch we brew every morning in the lobby. Nothing is cozier than relaxing by our lobby fireplace while enjoying a cup! You can read and watch more about them here. Only a couple blocks away on Newbury Street, Pavement brews coffee roasted by Counter Culture Coffee, and is quickly becoming a Boston institution with six shops throughout the city. They also serve a large selection of bagels and breakfast sandwiches. On a nice day, I’d recommend taking your order to go and enjoying it on a park bench just a block away on tree-lined Commonwealth Avenue. 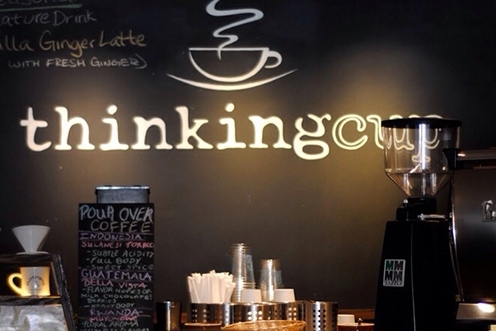 On the opposite side of Newbury Street, the Thinking Cup serves Stumptown Coffee and offers a wide selection of amazing sandwiches and pastries. It’s often not listed on the menu, but they also make a great hot chocolate if you’re looking for something even cozier on a blustery day. Take my word for it and try a slice of ricotta pound cake with your coffee. Trust me, it’s a great way to start your day, and I promise it tastes nothing like cheese. 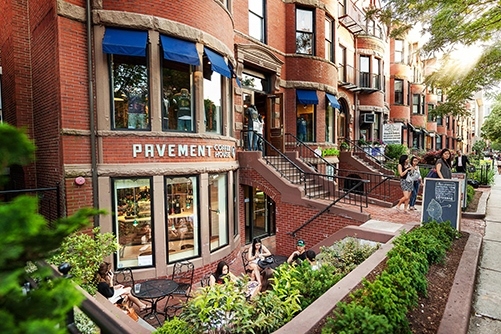 A few blocks from the hotel but also on Newbury Street, Barrington is worth the walk. 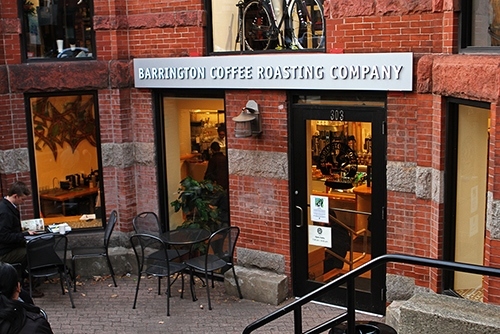 They roast their coffee right here in Massachusetts, out in the Berkshires. You can’t miss trying a cup brewed by one of the coolest looking coffee brewers around– a Steampunk. It makes a great cup of coffee and looks like an automated French press designed by George Jetson.